Resurgence of global interest in medicinal potential of plants during the last few decades has evoked tremendous efforts in exploring Traditional Systems of Medicine resulting in generation of scientific data for validating claims of therapeutic efficacy and safety of medicinal plant based drugs especially for the diseases of public health importance. The Council has undertaken a programme on integration of data from ancient knowledge, modem system of medicine and evidence generated through scientific studies on medicinal plants to evolve monographs on diseases of public health importance such as liver disorders, diabetes and lymphatic filariasis. 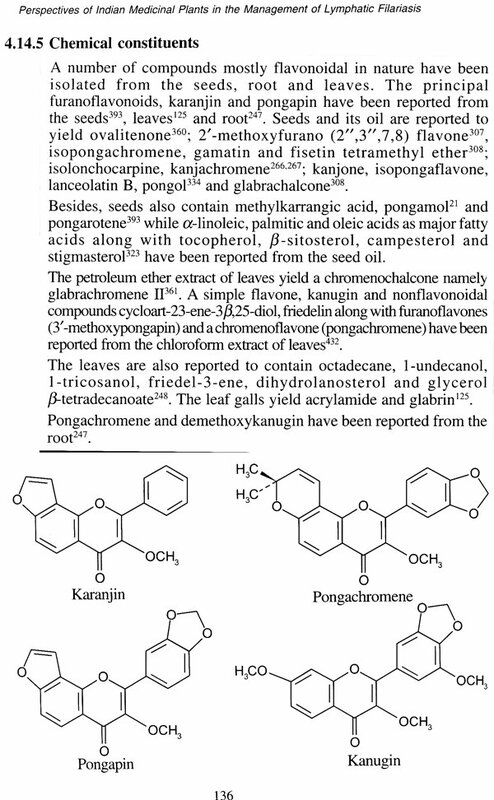 The envisaged monographs incorporate information on the diseases (including aetiopathogenesis) of public health importance and the plant drugs as given in the ancient texts of indigenous systems and Allopathic System of Medicine as well as the multidisciplinary research data generated through various scientific studies on such plant drugs with focus on pharmacological, toxicological, clinical, phytochemical and pharmacognostic studies with complete references on the work cited. Under this endeavour, the Council has already published "Perspectives of Indian Medicinal plants in the Management of Liver Disorders" and, second in the series is the monograph on lymphatic filariasis entitled, "Perspectives of Indian Medicinal Plants in the Management of Lymphatic Filariasis". 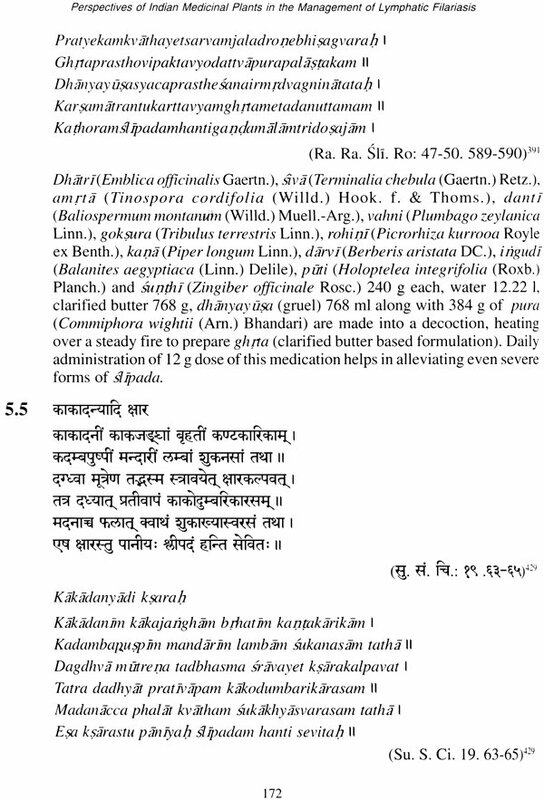 This specialized monograph may provide an insight from the point of view of Ayurveda, Unani, Siddha and Allopathic Systems of Medicine, rationale of use of plant drugs of Indian Systems of Medicine, strengthen claims with respect to IPRJ patents for global acceptability, giving an insight in systematic and planned evaluation of plant drugs, basic and applied research and use of modem drug, leading eventually to concepts of therapy and therapeutic agents for lymphatic filiariasis. I trust that this initiative of the Council will be of immense use to researchers, academicians, scientific bodies, drug industry, clinicians of different systems of medicine and others interested in medicinal plants. I deeply appreciate the efforts of the Chairman and the members of the Scientific Advisory Group and Technical Review Committee. Lymphatic filariasis poses public health problem in India for decades. Our country implements mass drug programme and soap and water wash as morbidity management tool annually to control the disease through interruption of transmission that can lead to elimination by 2015. National policy is to achieve the same through massive mobilization of health workers throughout India. Under the ICMR programme on preparation of medicinal plant monographs on diseases of public health importance, a project was sanctioned in the area of lymphatic filariasis with the objective of listing medicinal plants and products reported to have been used in Traditional Indian Systems of Medicine, in folklore and investigated for antifilarial activity using modem scientific methodology. The present publication provides perception of filariasis as described in Ayurvedic, Unani, Siddha and Allopathic Systems of Medicine followed by management of the disease under these systems covering diagnosis and management of the disease by use of plants, classical formulations and modem drugs. 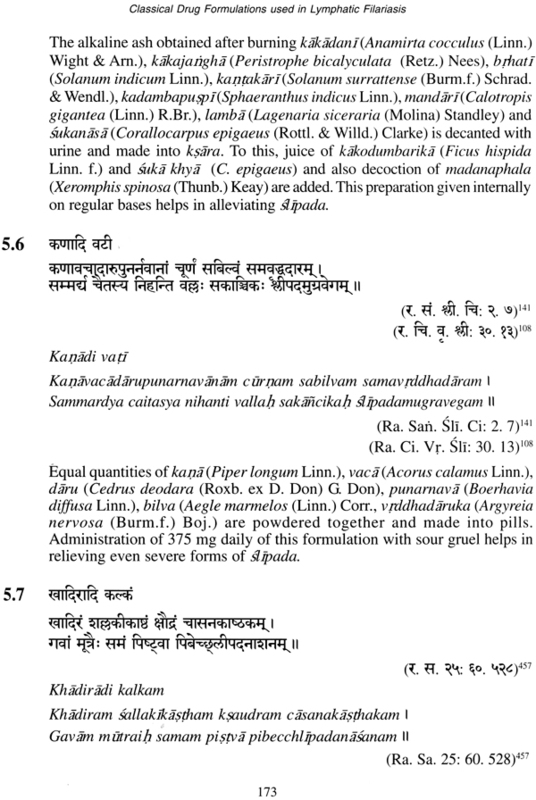 Selected 4 medicinal plants used in lymphatic filariasis and investigated with modem approach have been thoroughly reviewed giving other names, part used, botanical description and habitat, Ayurvedic description and properties, traditional uses, chemical constituents, standardization and quality control, antifilarial and related biological activities, clinical, toxicology/safety aspects and classical Ayurvedic formulations containing the respective plants. In addition, details of 25 other potential plant drugs not mentioned in Ayurveda but investigated with modem approach for treatment of filariasis have also been included. Drug formulations containing medicinal plants for treating lymphatic filariasis form another chapter in this publication. The last two chapters deal with the discussion and future approach as well as the summary. Hope this publication will be of help to the researchers, academicians and clinicians interested in antifilarial drugs from plants. Finally, the publication carries the message of up to date knowledge of the disease including approach to therapy for both individuals and community management using various available approaches. Lymphatic filariasis is a common disease in India and existed since ancient times. There have been important recent advances in Modem medicine pertaining to the aetiopathology, diagnosis, prevention and treatment of lymphatic filariasis (LF). Yet we still do not have any drugs that destroy all the adult filarial worms in the lymphatics; reverse the pathology of this disease once it is established or offer a 'cure' from this disfiguring malady. Medicinal plants are being used in India, especially in Ayurveda, from ancient times for the treatment of various diseases including filariasis. It is important to obtain useful information on these plant drugs, through proper scientific studies and to make use of this knowledge for the better management of this disease. Ayurveda gives the clinical description of the disease called Slipada that is same as lymphoedema. Considering the view that descriptions of LF in Allopathy and Slipada in Ayurveda are similar, it is apt to explore about the disease in both systems. Lymphatic filariasis will get eliminated as a public health problem if the control agenda of Global Programme for Elimination of Lymphatic Filariasis (GPELF) succeeds by 2020 in LF endemic countries such as India. Mass Drug Administration (MDA) of diethylcarbamazine citrate, albendazole and ivermectin is a global programme carried out in LF endemic countries once a year for six years. This programme was possible because of the generous gifts from Bill Gates Foundation, Glaxosmithkline and Merck. GPELF is collaborating with over 50 organizations to achieve this massive community programme. The second agenda of GPELF is morbidity control of lymphoedema caused by LF. The half time report of GPELF (2000-2010) summarized the activities towards eliminating LF world over. The Indian Council of Medical Research has initiated a significant step in bringing out Monographs on important diseases for which the presently available treatment could be improved. These volumes are expected to provide integrated information on the plant drugs used in the Indian Systems of Medicine, including the applied research on these drugs and their relevance in the context of Modem medicine. This monograph on Lymphatic filariasis is prepared with these objectives in mind and it is fervently hoped that this will be a useful addition to the existing scientific literature on the subject. This Monograph based on medicinal plants used in lymphatic filariasis required lot of inputs not only from Modem medicine, but more importantly from the ancient texts and literature on Ayurveda and other Indian Systems of Medicine. Some basic knowledge in Sanskrta, was helpful since some of the original literature in Ayurveda is in this language. 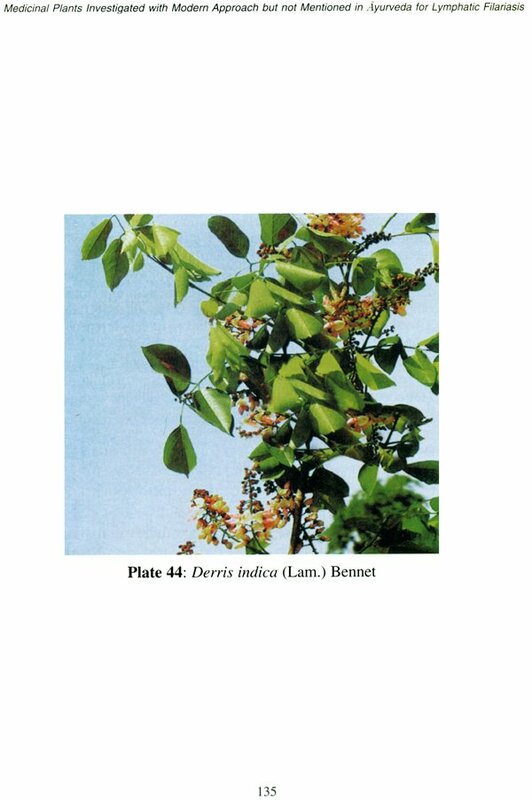 It was a challenging task to identify the medicinal plants prescribed for this disease in Indian Systems of Medicine.